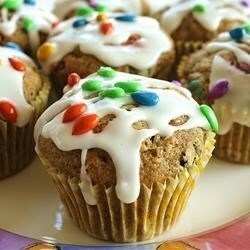 "These muffins are versatile and always moist and delicious. People are surprised to learn that there is zucchini in them. We served them often at Mossberry B&B on Ponderosa Drive." Preheat oven to 350 degrees F (175 degrees C). Lightly grease a 12 cup and a 6 cup muffin pan. In a large bowl, stir together zucchini and boiling water. In a separate bowl, mix flour, sugar, sunflower seeds, baking soda, salt, cinnamon, cloves, coriander, and nutmeg. Blend eggs, vegetable oil, and vanilla extract with the zucchini. Stir the zucchini mixture into the flour mixture. Spoon into the prepared muffin pans. Bake 20 to 25 minutes in the preheated oven, or until a knife inserted into the center of a muffin comes out clean. Recipe needs some work. won't try again. I believe these would be much better without the sunflower seeds. Will try them without next time.